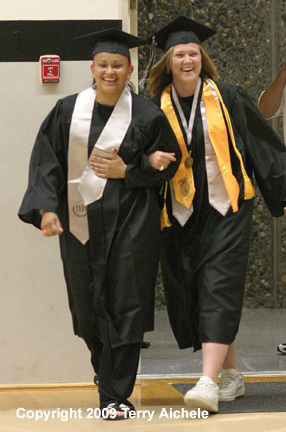 Kim Campos, left, and Breena Tolar the two senior Irrigon Knights softball team members received their diplomas in a special ceremony held Thursday morning, June 4, 2009 in the IHS gym. What Happens When The State Championship And Graduation Are Scheduled Just Hours Apart On The Same Day Hundreds Of Miles Apart? 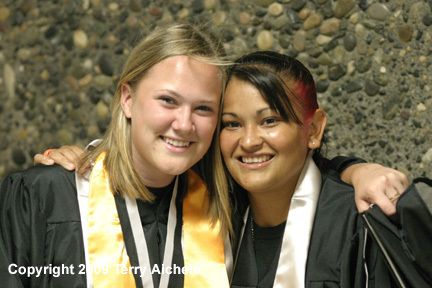 IRRIGON - Graduation from high school is a once in a lifetime event that many people experience. Students have spent twelve years studying and taking tests in order be granted that hard won piece of paper and entry into adulthood. Playing in a state high school championship game is an even rarer event that few students have the opportunity to experience. Both are important events in a person's life that are to be celebrated. But what happens when both momentus activities happen on the same day with just hours between the end of one and the start of the other hundreds of miles apart? The administrators, instructors and staff at Irrigon High School faced this dilemma earlier this week. The Irrigon Knights softball team was on it's way to the OSAA state 2A/1A final following their 3-1 win over Gaston on June 2. The championship game was scheduled for June 5 at 1PM at the Oregon State University softball field in Corvallis. 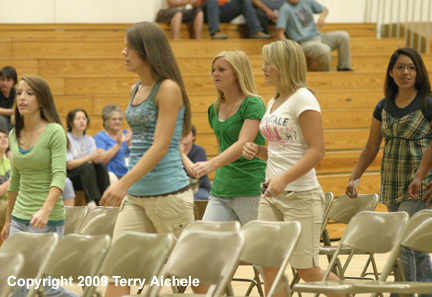 Just a few hours later Irrigon had graduation scheduled in their gym. With the two locations about 250 miles apart there was the conundrum of what could be done to provide the Knights two senior players Kim Campos and Breena Tolar with their graduation. 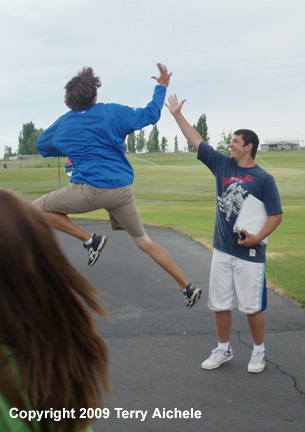 With these life shaping experiences on the line the leaders of Irrigon High School really had a challenge. 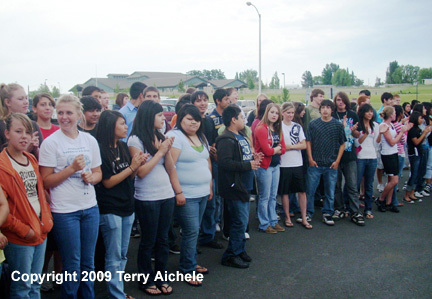 Irrigon High School has only been reopened for five years following several decades of students being transported to Riverside High in Boardman each day. How this situation was handled would likely set a tone for some time to come in the school district. It was a situation that the staff wrestled with until Wednesday, the day before the team was going to leave for Corvallis and two days before the championship game and graduation. 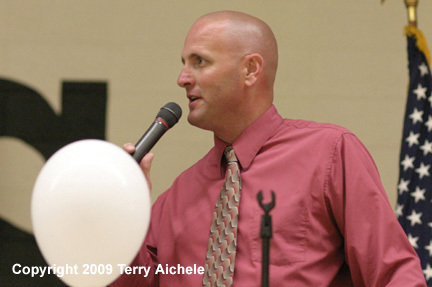 Principle Craig Bensen described how it was discussed if the two players could receive their diplomas early, before they left for the championship. 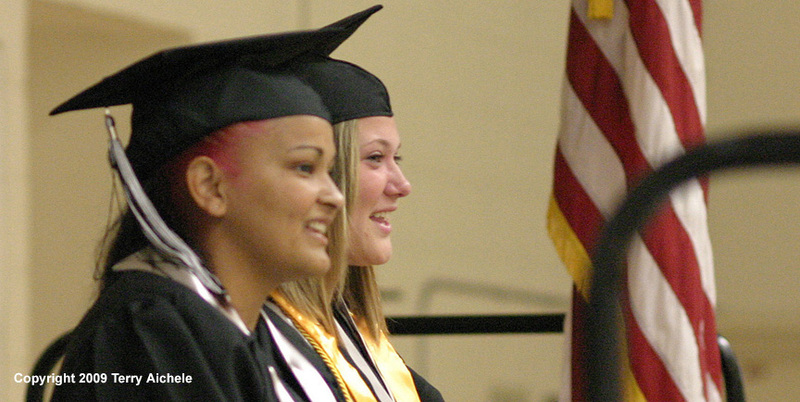 The administration was told that there was no problem to have an early graduation ceremony for the athletes. Normally there are rehearsals and practices for graduation. Once the decision had been made to ahead with the early graduation staff really got to work to finish setting up the gym for graduation. At eight a.m. on Thursday morning the gym looked ready for a graduation. The protective mats had been placed on the floor. The chairs for the graduates and staff were set out in their rows. The chairs and music stands for the band were set up. 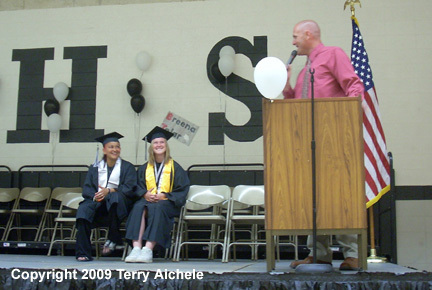 The names of the graduates were hung on the walls of the gym and helium filled balloons bobbed at the end of their strings. The gym looked ready for graduation. 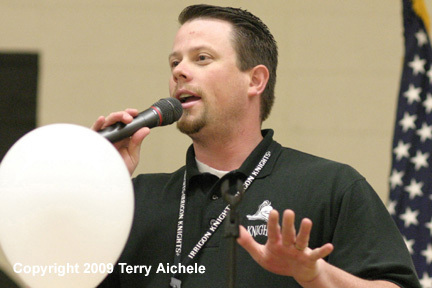 There were already members of the band in place, running through the music with instructor Jeff Searles. Staff were busy checking out the video projector and computer that would be used for part of the ceremony. Staci Stanger, the junior catcher for the Knights arrived to help out with preparation. She returned a few minutes later with a stack of graduation programs. About 8:30 a.m. a buzzer sounded and an announcement was made for all students to proceed to the gym for the softball team sendoff. The families of the two seniors were seated and then the softball team took their seats behind the parents. Then the band struck up Pomp and Circumstance as Kim and Breena entered the gymnasium. The two seniors took their place on the riser platform behind the speakers lectern. 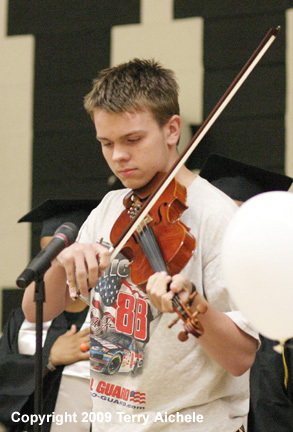 The national anthem was played by junior violinist Scott Troutman. A cheer and applause went up at the end of the performance. Principle Craig Bensen spoke about the situation of the team continuing to "Win, and win, and win." He spoke about how "What if they win, then what?" Then when they defeated Gaston "The wondering became reality as they go to the state finals." A huge cheer went up from the students filling the gym. "We looked into moving the game up or delaying the graduation. 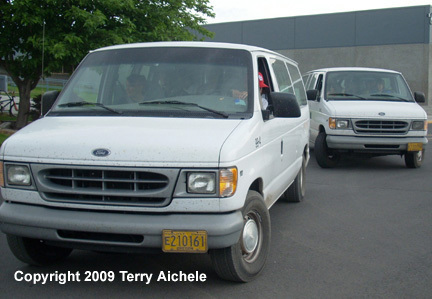 We even looked into making arrangements to fly the players and their parents back from Corvallis. They chose to stay in Corvallis to be part of their team." The crowd applauded the decision. Aaron Byers then gave an abridged version of his still a work in progress graduation speech. "If you are like mose people you won't remember what anybody says. Because I don't remember the speech from my graduation. What you do remember is the feeling. And right now I can only guess at what you are feeling. When this is over you will feel a sense of accomplishment. And that is what you will take with you." 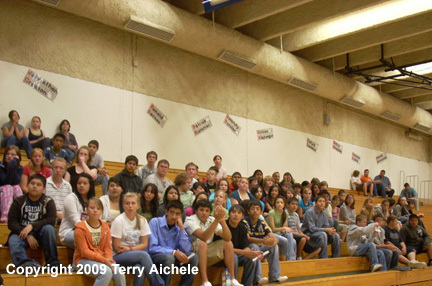 A presentation of photos of the two athletes growing up was projected on the wall of the gym. 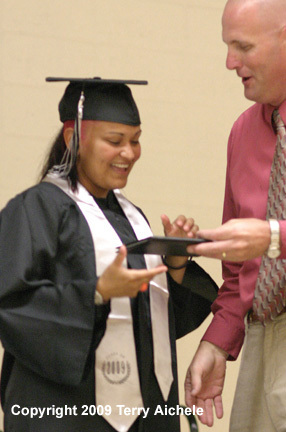 Kim Campos was called up "As the first graduating member of the class of 2009" to receive her diploma from Phylis Danielson and Pat McNamee. 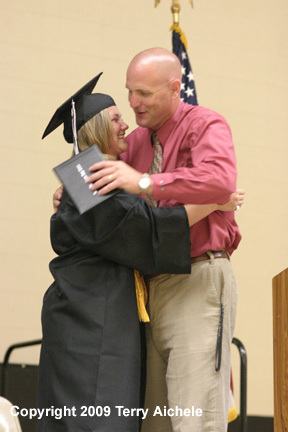 Moments later Breena Tolar received her diploma and gave Mr. Bensen a hug. 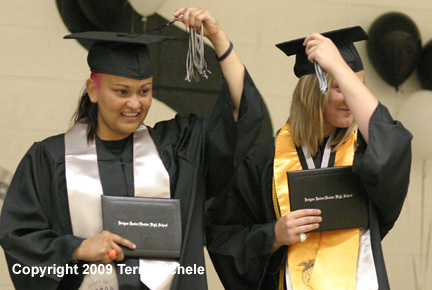 After receiving their diplomas and the applause died down the two graduates were told that as a symbol their graduating from Irrigon High they could move their tassels from the right to the left. The band struck up the recessional and the now graduated seniors followed by their families, teammates and the student body walked out of the gym. After the ceremony Kim Campos was all smiles. Someone in the crowd yelled out, "Were you surprised?" "Oh, yeah." said Kim. "It's a little crazy but that's good. I had no idea what was going on until I got here. It sets the tone off [for the trip to the championship]. It's a good start I really like it. It feels good." Kim's mom Yolanda was very pleased with the ceremony. "I didn't know it was going to be this big. I'm amazed how they pulled it off for the girls. This is great. I wanted to see my daughter walk and I did. Now I can say that she did both - graduate and play in the championship. It was important for her to play in the championship and be with the team. 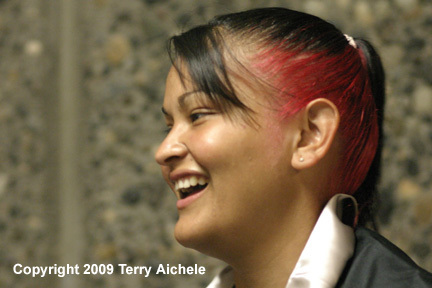 I am so pleased that she walked for her diploma and can play in the championship." Tera and Pat Tolar stood near their daughter Breena as she was being congratulated by the people streaming out of the gym. "We're so proud of her." said Tera. "It's amazing. I knew something was up but she didn't. I tried to get her to fix her hair up and she said 'What for?' It's amazing that the school went so far for them." "I had no idea. It was a complete surprise." said Breena Tolar about whether she had any idea a graduation ceremony was going to take place. I knew they were keeping a secret from me but I didn't know it was this big. I'm not going to miss my graduation or my game. I couldn't ask for anything more." Scott Troutman, a junior, then struck up Darth Vader's theme on the violin. When he was done he offered details on how he came to perform the solo. "They asked if anyone wanted to perform a solo. My hand shot up. 'Alright you're playing the National Anthem.' Ok, give me a moment to practice. When you are up their in front of everyone it's more nerve wracking. It was fun. I was really glad to play for the first graduating seniors. It was a great honor for me." Once the receiving line was done the two seniors grabbed a couple bags and they were out to the vans in the parking lot. A last hug and wave and the players climb into the vans.